At CES 2017, Samsung has introduced two new Chromebooks with support for Android apps. Samsung says its Chromebook Plus and Chromebook Pro are designed for Google Play, giving access to millions of Android apps. Samsung Chromebook Plus and Chromebook Pro feature a metal unibody design and the screen swivels 360-degree thanks to the hinge. Samsung Chromebook Plus and Chromebook Pro feature a 12.3-inch Quad HD display with a resolution of 2400 x 1600 pixels. The Chromebook Plus is powered by an ARM-based hexa-core OP1 processor, while the Chromebook Pro gets an Intel Core m3 chip. Both the Chromebooks comes with 4GB RAM and 32GB internal storage. Samsung says it has collaborated with Google to develop its 2017 Chromebook lineup. 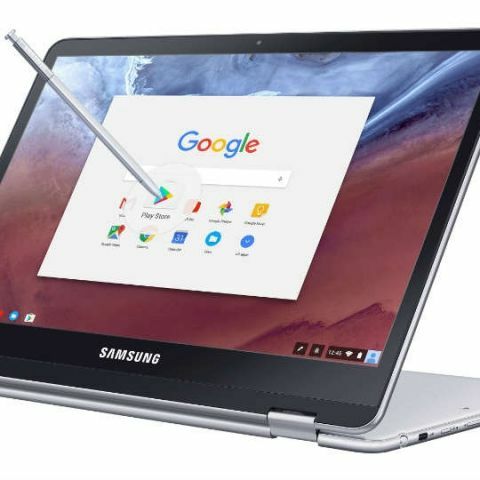 "With the Chromebook Plus and Pro, we’re partnering with Google to pair a sleek design with supreme flexibility, encouraging users to experience more with Google Play and Android apps, while continuing to provide simplicity, top-rated security and shareability inherent in Chromebooks," said Alanna Cotton, Vice President of Product Marketing at Samsung Electronics America. The most differentiating factor about these new Chromebooks is the support for a built-in stylus. The stylus adds support for on-screen content capture and ability to take notes. The stylus natively supports apps like Google Keep and Samsung ArtCanvas. Samsung Chromebook Plus and Chromebook Pro offer two USB-C ports and a microSD card reader. On the connectivity front, there is WiFi 802.11 ac and Bluetooth 4.0. Samsung Chromebooks come with 39Wh battery which the company claims is capable of delivering 8 hours of constant use. Samsung Chromebook Plus will be available in February at a starting price of $449 (approximately Rs 30,500). Samsung Chromebook Pro will be available later this year and pricing will be revealed close to availability.